Welcome back! 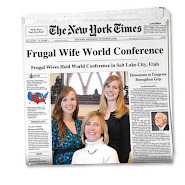 This is my last post about how my husband, Neill, and I handle finances. I've already dished on the money situation when we dated and then when we moved in together and in this post I want to share with you how we are handling things now that we are married. In my last post, I mentioned that we opened up a joint saving account a while ago that we've used in addition to each of our personal saving accounts. Now, however, having our individual accounts just doesn't seem to feel right anymore. Even though both of us have said that whatever we save individually is really for us, we want to make that thought a reality. So, we decided to totally revamp our organization. With this new set-up neither one of us will keep a personal savings account. We'll only put money into our joint savings. This certainly wasn't something I would have wanted to do originally, but right now it makes the most sense for us. We decided to keep a total of two joint savings accounts so that we can save money for different purposes. One is a Save for a Rainy Day Account. This is our six-month emergency fund that is not to be touched unless we have . . . an emergency. The second is a Save to Spend Account. This is where we can save for vacations or a new piece of furniture (like maybe that couch I mentioned in my last post!). The only catch? Our numbers aren't quite where we would like them to be. So, we've started a friendly-competition to get into savings gear. We each have a savings goal (different, to accommodate our salary difference) and the first person to reach their goal wins $500 dollars out of the Save to Spend account. A bonus of merging our savings is that it motivated us to finally set up an emergency fund. Since Neill is still the primary wage earner in the family it is really important to me that we have an emergency fund set aside. We've always known where we might pull money from if we found ourselves in a dire situation, but this is the first time actually pulling the money, setting it aside all in one place, and taking a hard look at whether or not we have enough. I'm really excited about our new plan because I feel like we are a bajiliion steps closer to following through on our new years resolution to be financially secure. As you’ve probably already gathered, I don't have any secrets to successfully negotiating finances in a relationship. But for us, communicating and being flexible seem to really help. Since we both keep an eye on our finances and discuss them pretty regularly we are able to realize when something isn't working. And, we aren't afraid to switch things up a bit. Who knows? Maybe in another year we'll decide to merge Finances can be a touchy subject to talk about and I think the uneasiness surrounding money-talk makes it extra difficult for couples. So, I thought I'd quiet that little voice in my head that says discussing money isn't appropriate and lay it all out there for everyone. I’d be lying if I said that it was easy! But, I had a good time writing these posts and I hope you've enjoyed reading them! Please do come over to Married in Chicago and say hello from time to time. I’d love to hear from you! motivates you to save money? Alisha is a 20-something newlywed pursuing a doctoral degree in psychology and blogs at Married in Chicago. Good thought about the separate savings accounts. We have two savings account associated with our checking account, but neither is dedicated to anything. I like your idea a lot. I really liked your guest posts, I think you are right no matter what system you do the most important thing is to be honest. I meant to comment on your last post too. We do an excel budget. We've met it probably 5 times in 13 years of marriage, so that's kind of a joke:-) But we look at it from the point of view that you expressed, it shows how little things add up. In particular because at the bottom of the spreadsheet I keep an individual row of what the current balance is for every savings accounts and all of our debts (with the compounding interest). I even include a line just for estimated taxes. It's all programmed to automatically update with the items above so if I pay an extra $50 each pay period then I can see the total difference by the end of the year in two seconds. We are joint everything, no mad money or seperate accounts. It works for us because a couple of times a year we do a deep dive into our networth and goals. During that time we also change contribution amounts for all of our major savings. They are automatically funneled out before the paycheck hits the bank. Having that assurance that the important things are saved for at an amount both of you want makes the how and why of your everyday expenses not very important. Also, we give each other a heads up about practically every purchase. Not asking for permission like you said but saying stuff like, "I found a great picture for the living room, it's my friend's birthday on Friday and I'm taking her out to lunch, I'm taking the kids shopping for clothes this weekend"
The only challenge we had to overcome with joint everything was date/present money. I pay bills and balance the checkbook. My husband would rather have a verbal we are doing good/not so good every couple of weeks then going into the details. That helps him plan how much he can spend on surprising me. If it's something big then he will use his CC we set aside for business travel and pay off every month. Every week I replenish cash in his wallet to $100-150 because he likes to use cash. But it's not mad money, he uses it to pay the kids for chores, quick business lunches (that he gets reimbursed for), dates, or when he picks up groceries for me. He really only likes to use cash, hence why I pay the bills. He used to pay his utilities and rent all in cash before we were married. It can be tricky to merge finances- my husband and I started off with separate accounts when we werefirst married and have now joined everything- it's been an art- one we now mastered- as I am a huge saver and my husband is a huge saver- financial differences collide! it's been a learning experience to merge the two worlds together so we enjoy life- but that we are also secure- balance! and you are right commuincation is key! Thanks for sharing your stories ladies! I'm glad that my story resonated with you. I'd feel pretty silly sharing so much otherwise!